Recycle Printers, Computers and Other IT Equipment with certified hard drive destruction. Convenient pickup services nationwide for Printer Recycling & Disposal. Certified E-Waste Recycling, IT Asset Disposition and on-site hard drive shredding. 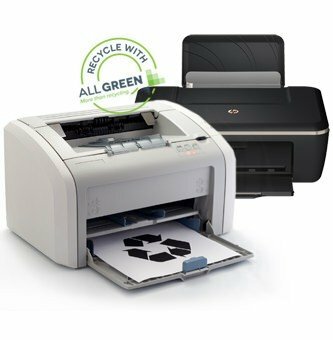 At All Green Electronics Recycling, we will recycle your printer in an eco-friendly manner. Instead of leaving these devices in your garages or warehouses, let All Green Electronics Recycling pick them up at your convenience. We will take your printers, inkjets, toners, copy machines, and any of your obsolete printing devices. Printer recycling is one of the most responsible ways in which you and/or your company can help protect the environment for future generations. Recycle responsibly by recycling with All Green. While many electronic recycling company use a one size fits all approach, we believe this only compounds the problems associated with disposing of electronic equipment. We offer a comprehensive approach to recycling that is both financially advantageous for your company and more environmentally friendly. Printers that have reached the end of their useful life offer the opportunity for repurposing and remarketing, which in turn provides the dual benefit of opening up an additional revenue stream and allowing for the recycling of precious metals. Through our expertise and experience, we can determine the best strategy for recycling of your decommissioned electronics in an environment that is safe, secure, and cost-effective. We seek to make the printer recycling process as easy as possible for our clients, and that means we’ll come pick up your old printers at your location. As the operator of the largest fleet of IT recycling trucks in North America, we are ideally positioned to come to your location at a time that’s convenient for you, and we’ll take care of the packaging, labeling, and removal of your old printers. We even offer our clients the opportunity to track the progress of your recyclables through our state-of-the-art online management portal. When recycling electronics, we consider that equipment may contain sensitive data, and we treat it with the same diligence with which we would treat our own sensitive data. Our track record of certified integrity and assurance provides you with the peace of mind that we will tend to our responsibilities with the utmost care and concern for our clients. We have the highest standards in the industry. We carefully and responsibly manage assets every step of the way and offer our clients complete transparency of our data. There are a number of laws on recycling and they can vary from state to state. Failing to adhere to all legal requirements could seriously compromise your business. You could be subject to large fines and have your reputation irrevocably damaged for improper disposal of old printers. We don’t just meet government guidelines, we go above and beyond minimal requirements, ensuring all items entrusted to our care are recycled according to legal guidelines and high ethical standards. We make it our mission to protect your company from risk and help provide a sustainable future for our planet. Used printers and printer cartridges have a major impact on landfill space and the environment. More than 350 million used printer cartridges end up in landfills every year. A woeful 70% of printer cartridges aren’t recycled although they can be remanufactured three to four times before they actually wear out. The heavy metals in printers account for much of the lead, cadmium, copper, and chromium found in landfills. It takes 450 to 1,000 years for printer cartridge waste to break down. All of that waste and contamination can be avoided if printer owners divert this waste to recycling companies like All Green Electronics Recycling. Recycling a used printer cartridge saves energy, water, and keeps trash out of the landfill. Recycling a printer cartridge saves almost a gallon of oil (the amount of oil needed to manufacture a new printer cartridge), avoids water contamination caused by leeching of heavy metals into the soil, and keeps about two pounds of waste out of the landfill. Discarded printer cartridges add 400,000 tons of waste to landfills every year. A company can dramatically reduce their carbon footprint by recycling printers and printer cartridges. An electronics recycling company will normally sell used but working printers on the grey market because the printer has value above its scrap value. Used printer cartridges will be remanufactured and sold or sold to other companies that remanufacture printer cartridges. Printers and printer cartridges that have reached the end of their life are scrapped for their metals and plastic content. Printer cartridges have both precious metal and copper components. Printers have steel and copper as well, but they are also home to toxic metals such as lead, cadmium, and chromium. That is another important reason these electronic devices should be sent to All Green Electronics Recycling – we can safely recycle these toxic metals. We offer free pickup of e-waste from businesses. Individuals and small companies with small amounts of e-waste can drop off e-waste at our electronic recycling pick-up centers. We also offer assured destruction of information contained within the memory of printers. Many companies find this service invaluable, particular those with intellectual property. 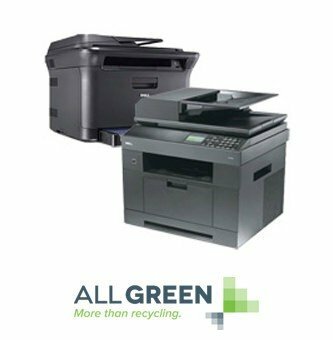 With so many convenient options for recycling printers and printer cartridges there simply is no excuse for not doing so.